How to secure your online business from cyber threats? Ecommerce revenue worldwide amounts to more than 1.7 trillion US dollars, in the year 2018 alone. And the growth is expected to increase furthermore. However, with growth comes new challenges. One such problem is cybersecurity. In 2017, there were more than 88 million attacks on eCommerce businesses. And a significant portion includes small businesses. Moreover, online businesses take a lot of days to recover from the attacks. Some businesses completely shut down due to the aftermath of the security breaches. So, if you are a small business, it is essential to ensure the safety and security of your eCommerce site. Else, the risks pose a potential threat to your online business. Here we discuss some basics to ensure proper security to your eCommerce site. An SSL Certificate ensures that the browser displays a green padlock or in a way shows to the site visitors that they are safe; and that their data is protected with encryption during the transmission. To enable or enforce an SSL certificate on your site, you should enable HTTPS—secured version of HyperText Transfer Protocol (HTTP)—across your website. In general, HTTP is the protocol web browsers use to display web pages. So, HTTPS and SSL certificates work hand in hand. Moreover, one is useless without the other. However, you have to buy an SSL certificate that suits your needs. Buying a wrong SSL certificate would do no good for you. Several types of SSL certificates are available based on the functionality, validation type, and features. Domain Validation SSL Certificate: This SSL certificate is issued after validating the ownership of the domain name. Organization Validation SSL Certificate: This SSL certificate additionally requires you to verify your business organization. The added benefit is it gives the site visitors or users some more confidence. Moreover, small online businesses should ideally opt for this type of SSL certificate. Extended Validation SSL Certificate: Well, this type of SSL certificate requires you to undergo more rigorous checks. But when someone visits your website, the address bar in the browser displays your brand name. It indicates users that you’re thoroughly vetted and highly trustworthy. Here are some SSL certificate types based on the features and functionality. Single Domain SSL Certificate: This SSL certificate can be used with one and only one domain name. Wildcard SSL Certificate: This SSL certificate covers the primary and all the associated subdomains. Every subdomain along with the primary domain example.com will be covered under a single wildcard SSL certificate. Multi-Domain SSL Certificate: One single SSL certificate can cover multiple primary domains. The maximum number of domains covered depends on the SSL certificate vendor your purchase the certificate from. Typically, a Multi-Domain SSL Certificate can support up to 200 domain names. Nowadays, making your business site secure with SSL certificate is a must. Otherwise, Google will punish you. Yes, Google ranks sites with HTTPS better than sites using no security. However, if you are processing online payments on your site, then SSL security is essential. Otherwise, bad actors will misuse your customer information such as credit card details, eventually leading to identity theft and fraudulent activities. In general, a firewall monitors incoming and outgoing traffic on your servers, and it helps you to block certain types of traffic—which may pose a threat—from interacting or compromising your website servers. Firewalls are available in both virtual and physical variants. And it depends on the type of environment you have in order to go with a specific firewall type. Many eCommerce sites use something called a Web Application Firewall (WAF). On top of a typical network firewall, a WAF gives more security to a business site. And it can safeguard your website from various types of known security attacks. So, putting up a basic firewall is essential. Moreover, using a Web Application Firewall (WAF) is really up to the complexity of the website or application you have put up. A type of attack used to bring your site down by sending huge amounts of traffic is nothing but denial-of-service-attack. In this attack, your site will be bombarded with spam requests in a volume that your website can’t handle. And the site eventually goes down, putting a service disruption to the normal/legitimate users. However, it is easy to identify a denial-of-service-request, because too many requests come from only one source. And by blocking that source using a Firewall, you can defend your business site. However, hackers have become smart and highly intelligent. They usually compromise various servers or user computers across the globe. And using those compromised sources, hackers will send massive amounts of requests. This type of advanced denial-of-service attack is known as distributed-denial-of-service-attack. Or simply put a DDoS attack. When your site is attacked using DDoS, a common Firewall is not enough; because a firewall can only defend you from bad or malicious requests. But in DDoS, all requests can be good by the definition of the Firewall, but they overwhelm your website servers. Some advanced Web Application Firewalls (WAF) can help you mitigate the risks of DDoS attacks. Also, Internet Service Providers (ISPs) can detect them and stop the attacks from hitting your website servers. So, contact your ISP and get help from them on how they can protect your site from DDoS attacks. If you need a fast and straightforward way to secure your website from distributed-denial-of-service attacks, services like Cloud Secure from Webscale Networks is a great option. In the end, it is better to have strategies in place to mitigate DDoS attacks. Otherwise, your business site may go down and can damage your reputation—which is quite crucial in the eCommerce world. A Malware is a computer program that can infect your website and can do malicious activities on your servers. If your site is affected by Malware, there are a number of dangers your site can run into. Or, the user data stored on your servers might get compromised. So, scanning your website regularly for malware detection is essential. Symantec Corporation provides malware scanning and removal tools. These tools can help your site stay safe from various kinds of malware. If you are storing any user or business related data, it is best to store the data in encrypted form, on your servers. If the data is not encrypted, and when there is a data breach, a hacker can easily use the data—which may include confidential information like credit card details, social security number, etc. But when the data is encrypted, it is much hard to misuse as the hacker needs to gain access to the decryption key. However, you can use a tokenization system. In which, the sensitive information is replaced with a non-sensitive data called token. When tokenization implemented, it renders the stolen data useless. Because the hacker cannot access the Tokenization system, which is the only component that can give access to sensitive information. Anyhow, your tokenization system should be implemented and isolated properly. Use strong passwords that are at least 15 character length for your sites’ admin logins. And when you are remotely accessing your servers, use SSH key-based logins wherever possible. SSH key-based logins are proven to be more secure than password-based logins. Not only you, urge your site users and customers to use strong password combinations. Moreover, remind them to change their password frequently. Plus, notify them about any phishing scams happening on your online business name. For example, bad actors might send emails to your customers giving lucrative offers. And when a user clicks on the email, he will be redirected to a site that looks like yours, but it is a phishing site. And when payment details are entered, the bad actor takes advantage and commits fraudulent activities with the stolen payment info. So, it is important to notify your user base about phishing scams and make your customers knowledgeable about cybersecurity. When you are working on your business site or logging into your servers, avoid public wifi networks. Often, these networks are poorly maintained on the security front. And they can become potential holes for password leaks. However, public wifi networks can be speedy. So, when you cannot avoid using a public wifi network, use VPN services like ProtonVPN, CyberGhost VPN, TunnelBear VPN, etc, to mitigate the potential risks. To run an online business, you have to use various software components, from server OS to application middleware and frameworks. Ensure that all these components are kept up to date timely and apply the patches as soon as they are available. Often these patches include performance improvements and security updates. Some business owners might feel that this is a tedious process. But remember, one successful cyber attack has the potential to push you out of business for several days, if not entirely. In this 21st century, web technology is growing and changing rapidly. So do the hackers from the IT underworld. The steps mentioned above are necessary. But we cannot guarantee that they are sufficient. Moreover, each business case is different. You always have to keep yourself up to date. And it would help if you took care of your online business security from time to time. Failing which can make your business site a victim of cyber attacks. Large companies are hit by cyberattacks at an above average rate, according to the Cybersecurity Monitor of Dutch statistics bureau CBS for 2018. Among companies of 250+ employees, 39 percent were hit at least once by a cyberattack in 2016, such as a hack or DDoS attack. By contrast, around 9 percent of small companies (2-10 employees) were confronted with such an ICT incident. Of the larger companies, 23 percent suffered from failure of business processes due to the outside cyberattacks. This compares to 6 percent for the smaller companies. Of all ICT incidents, failures were most common, for all sizes, though again, the larger companies were more affected (55%) than the smaller ones (21%). The incidents led to costs for both groups of companies. CBS noted that ICT incidents can arise from both from an outside attack and from an internal cause, such as incorrectly installed software or hardware or from the unintentional disclosure of data by an employee. The fact that larger companies suffer more from ICT incidents can be related to the fact that more people work with computers; this increases the chance of incidents. In addition, larger companies often have a more complex ICT infrastructure, which can cause more problems. The number of ICT incidents also varies per industry. For example, small businesses in the ICT sector (12%) and industry (10%) often suffer from ICT incidents due to external attacks. Small companies in the hospitality sector (6%) and health and welfare care (5%) were less often confronted with cyberattacks. Compared to larger companies, ICT incidents at small companies more often have an internal cause: 2 out 3, compared to 2 out of 5 for larger companies. ICT incidents at small companies in health and welfare care most often had an internal cause (84%). In the ICT sector, this share was 60 percent. About 7 percent of companies with an ICT incident report them to one or more authorities, including police, the Dutch Data Protection Authority AP, a security team or their bank. The largest companies report ICT incidents much more often (41%) than the smallest companies (6%). Large companies report these ICT incidents most frequently to the AP, complying with law. After that, most reports are made to the police. The smallest companies report incidents most often to their bank. Small businesses are less often confronted with ICT incidents and, in comparison with large companies, take fewer security measures. Around 60 percent of small companies take three or more measures. This goes to 98 percent for larger companies. Dutch businesses and the public sector are well protected against cybersecurity threats compared to other countries, according to a report from the Central Planning Bureau on the risks for cybersecurity. Dutch websites employ encryption techniques relatively often, and the ISPs take measures to limit the impact of DDoS attacks, the report said. Small and medium-sized businesses are less active than large companies in protecting their activities, employing techniques such as data encryption less often, the CPB found. This creates risks for small business and consumers that could be avoided. The report also found that the Dutch are more often victims of cybercrime than other forms of crime. This implies a high cost for society to ensure cybersecurity. In 2016, already 11 percent of businesses incurred costs due to a hacking attempt. The threat of DDoS attacks will only increase in the coming years due to the growing number of IoT devices. This was already evident in the attacks against Dutch bank websites earlier this year. A further risk is that over half the most important banks in the world use the same DDoS protection service. According to the paper Financieele Dagblad, this supplier is Akamai. The company provides DDoS protection for 16 of the 30 largest banks worldwide. The Dutch banks ABN Amro, ING and Rabobank said they were not dependent on a single provider. The CPB report also found that the often reported shortage of qualified ICT staff is less of a threat than thought. The number of ICT students has risen 50 percent in four years and around 100,000 ICT jobs have been added in the country since 2008. Already 5 percent of all jobs are in ICT. This puts the Netherlands at the top of the pack in Europe, alongside the Nordic countries. Protesters in Germany have been camping out at the Hambach Forest, where the German energy company RWE has plans to mine for coal. Meanwhile, it’s been reported that RWE’s website was under attack as police efforts to clear the protesters from the woods were underway. According to Deutsche Welle, unknown attackers launched a large-scale distributed denial-of-service (DDoS), which took down RWE’s website for virtually all of Tuesday. No other systems were attacked, but efforts to clear away the protesters have been ongoing for the better part of the month, and activists have reportedly made claims that they will be getting more aggressive in their tactics. Activists have occupied the forest in hopes of preventing RWE from moving forward with plans to expand its coal mining operations, which would effectively clear the forest. In addition to camping out in the forest, the protesters have reportedly taken to YouTube to spread their message. Reports claim that a clip was posted last week by Anonymous Deutsch that warned, “If you don’t immediately stop the clearing of the Hambach Forest, we will attack your servers and bring down your web pages, causing you economic damage that you will never recover from,” DW reported. “Together, we will bring RWE to its knees. This is our first and last warning,” the voice from the video reportedly added. DDoS attacks are intended to cripple websites, and the attack on RWE allowed the activists to make good on their threat, at least for one day. ““This is yet another example that illustrates the DDoS threat to [softer targets in] CNI [critical network infrastructure]. RWE is an operator of an essential service (energy) in Germany. The lights didn’t go out but their public-facing website was offline as a result of this attack,” said Andrew Llyod, president, Corero Network Security. Three young hackers went from believing they were “untouchable” to helping the FBI stop future cyberattacks. The trio of hackers behind the Mirai botnet — one of the most powerful tools used for cyberattacks — has been working with the FBI for more than a year, according to court documents filed last week. Now the government is recommending they be sentenced to continue assisting the FBI, instead of a maximum five years in prison and a $250,000 fine. Originally, a probation officer on the case recommended that all three defendants be sentenced to five years’ probation and 200 hours of community service. The three defendants are set to be sentenced by a federal judge in Alaska. The sentencing plea Tuesday was earlier reported by Wired. Governments have taken a new approach with young, first-offender hackers, in the hopes of rehabilitating them and recruiting them to help defend against future attacks. The UK offers an alternative called the “cybercrime intervention workshop,” essentially a boot camp for young hackers who have technical talent but poor judgment. The three defendants — Josiah White, Paras Jha and Dalton Norman — were between the ages of 18 and 20 when they created Mirai, originally to take down rival Minecraft servers with distributed denial-of-service attacks. DDoS attacks send massive amounts of traffic to websites that can’t handle the load, with the intention of shutting them down. Mirai took over hundreds of thousands of computers and connected devices like security cameras and DVRs, and directed them for cyberattacks and traffic scams. In one conversation, Jha told White that he was “an untouchable hacker god” while talking about Mirai, according to court documents. The botnet was capable of carrying out some of the largest DDoS attacks ever recorded, including one in 2016 that caused web outages across the internet. The three defendants weren’t behind the massive outage, but instead were selling access to Mirai and making thousands of dollars, according to court documents. The three hackers pleaded guilty in December, but had been helping the government with cybersecurity for 18 months, even before they were charged. Prosecutors estimated they’ve worked more than 1,000 hours with the FBI — about 25 weeks in a typical workplace. That includes working with FBI agents in Anchorage, Alaska, to find botnets and free hacker-controlled computers, and building tools for the FBI like a cryptocurrency analysis program. In March, the three hackers helped stop the Memcached DDoS attack, a tool that was capable of blasting servers with over a terabyte of traffic to shut them down. According to US officials, the three hackers also last year helped significantly reduce the number of DDoS attacks during Christmas, when activity usually spikes. Along with helping the FBI, the three defendants have also worked with cybersecurity companies to identify nation-state hackers and assisted on international investigations. Jha now works for a cybersecurity company in California while also attending school. Dalton has been continuing his work with FBI agents while attending school at the University of New Orleans, and White is working at his family’s business. Prosecutors heavily factored their “immaturity” and “technological sophistication” as part of the decision. “All three have significant employment and educational prospects should they choose to take advantage of them rather than continuing to engage in criminal activity,” the court documents said. Aatish Pattni, regional director, UK & Ireland, Link11, explores in Information Age how DDoS attacks have grown in size and sophistication over the last two decades. What is the biggest cyber-threat to your company? In April 2018, the UK’s National Crime Agency answered that question by naming DDoS attacks as the joint leading threat facing businesses, alongside ransomware. The NCA noted the sharp increase in DDoS attacks on a range of organisations during 2017 and into 2018, and advised organisations to take immediate steps to protect themselves against the potential attacks. It’s no surprise that DDoS is seen as such a significant business risk. Every industry sector is now reliant on web connectivity and online services. No organisation can afford to have its systems offline or inaccessible for more than a few minutes: business partners and consumers expect seamless, 24/7 access to services, and being forced offline costs a company dearly. A Ponemon Institute study found that each DDoS incident costs $981,000 on average, including factors such as lost sales and productivity, the effect on customers and suppliers, the cost of restoring IT systems, and brand damage. So how have DDoS attacks evolved from their early iterations as stunts used by attention-seeking teens, to one of the biggest threats to business? What techniques are attackers now using, and how can organisations defend themselves? The first major DDoS attack to gain international attention was early in 2000, launched by a 15-year-old from Canada who called himself Mafiaboy. His campaign effectively broke the internet, restricting access to the web’s most popular sites for a full week, including Yahoo!, Fifa.com, Amazon.com, eBay, CNN, Dell, and more. DDoS continued to be primarily a tool for pranks and small-scale digital vandalism until 2007, when a range of Estonian banking, news, and national government websites were attacked. The attack sparked nationwide riots and is widely regarded as one of the world’s first nation-state acts of cyberwar. 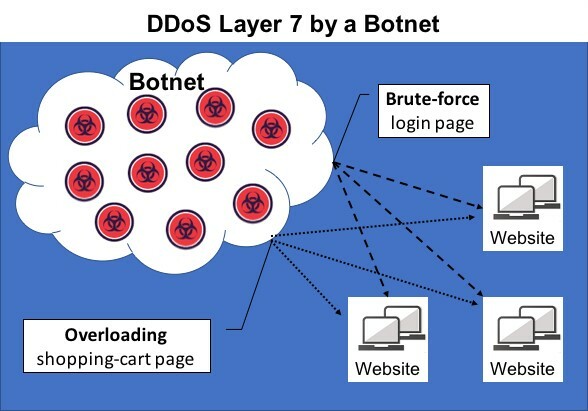 The technique is also successful as a diversion tactic, to draw the attention of IT and security teams while a second attack is launched: another security incident accompanies up to 75% of DDoS attacks. Denial of service has also been used as a method of protest by activist groups including Anonymous and others, to conduct targeted take-downs of websites and online services. Anonymous has even made its attacks tools freely available for anyone to use. Recent years have also seen the rise of DDoS-on-demand services such as Webstresser.org. Before being shut down by international police, Webstresser offered attack services for as little as £11, with no user expertise required – yet the attacks were powerful enough to disrupt operations at seven of the UK’s biggest banks. In October 2016, a new method for distributing DoS attacks emerged – using a network of Internet of Things (IoT) devices to amplify attacks. The first of these, the Mirai botnet infected thousands of insecure IoT devices to power the largest DDoS attack witnessed at the time, with volumes over a Terabyte. By attacking Internet infrastructure company Dyn, Mirai brought down Reddit, Etsy, Spotify, CNN and the New York Times. This was just a signpost showing how big attacks could become. In late February 2018, developer platform Github was hit with a 1.35 Tbps attack, and days later a new record was set with an attack volume exceeding 1.7 Tbps. These massive attacks were powered by artificial intelligence (AI) and self-learning algorithms which amplified their scale, giving them the ability to disrupt the operations of any organisation, of any size. Attacks are not only getting bigger but are increasingly multi-vector. In Q4 2017, Link11 researchers noted that attackers are increasingly combining multiple DDoS attack techniques. Over 45% of attacks used 2 or more different techniques, and for the first time, researchers saw attacks which feature up to 12 vectors. These sophisticated attacks are difficult to defend against, and even low-volume attacks can cause problems, as happened in early 2018 when online services from several Dutch banks, financial and government services were brought to a standstill. As DDoS attacks now have such massive scale and complexity, traditional DDoS defences can no longer withstand them. Firewalls, special hardware appliances and intrusion detection systems are the main pillars of protection against DDoS, but these all have major limitations. Current attack volume levels can easily overload even high-capacity firewalls or appliances, consuming so many resources that that reliable operation is no longer possible. The next iteration of attackers set out to use DDoS as an extortion tool, threatening organisations with an overwhelming attack unless they meet the attacker’s demand for cryptocurrency. Notable extortionists included the original Armada Collective, which targeted banks, web hosting providers, data centre operators as well as e-commerce and online marketing agencies in Greece and Central Europe. Between January and March 2018, Link11’s Security Operation Centre recorded 14,736 DDoS attacks, an average of 160 attacks per day, with multiple attacks exceeding 100 Gbps. Malicious traffic at these high volumes can simply flood a company’s internet bandwidth, rendering on-premise network security solutions useless. What’s needed is to deploy a cloud-native solution that can use AI to filter, analyse, and block web traffic if necessary before it even reaches a company’s IT systems. This can be done by routing the company’s Internet traffic via an external, cloud-based protection service. With this approach, incoming traffic is subject to granular analysis, with the various traffic types being digitally ‘fingerprinted’. Each fingerprint consists of hundreds of properties, including browser data, user behaviour, and its origin. The solution builds up an index of both normal and abnormal, or malicious traffic fingerprints. When known attack patterns are detected in a traffic flow, the attack ‘client’ is blocked immediately and automatically in the cloud, before it even reaches customers’ networks – so that only clean; legitimate traffic reaches the organisation. However, regular traffic is still allowed, enabling a business to continue unaffected, without users being aware of the filtering process. The solution’s self-learning AI algorithms also help to identify and block attacks for which there is no current fingerprint within a matter of seconds, to minimise the impact on the organisation’s website or web services. This means each new attack helps the system improve its detection capabilities, for the benefit of all users. Furthermore, this automated approach to blocking attacks frees up IT and security teams, enabling them to focus on more strategic work without being distracted by DDoS attempts. In conclusion, DDoS attacks will continue to evolve and grow, simply because with DDoS-for-hire services and increasingly sophisticated methods, they are relatively easy and cheap to do – and they continue to be effective in targeting organisations. But by understanding how attacks are evolving and implementing the protective measures described here, organisations will be better placed to deny DDoS attackers.